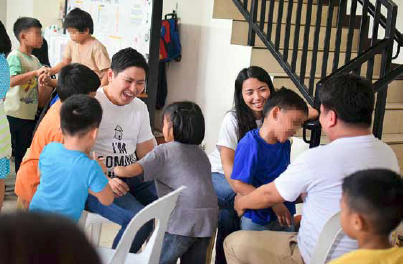 More than 30 kids of Tahanan ng Pagmamahal enjoyed free food and a mini program — thanks to the dedication of one Light Group (LG) who gathers once every quarter to do an outreach activity. In 2012, one Caring Group, now called Light Group, gathered together to share their struggles and blessings, and then pray for each other. #travelgoal — to conduct outreach activities. As time went by, several things have changed. Among their group, two couples already got married. They became busy with their career, too. Their leader, Bernie Sacro, also entered the seminary. Through it all, their friendship remained and their desire to help other people continues. So they decided to gather quarterly to reach out to different organizations. They have already been to various ministries to spread God’s love. Last year, the group chose to help Tahanan ng Pagmamahal, a mercy ministry of the Light of Jesus Family. Tahanan serves as a home for children with no parents to take care of them. Single Travel brought food and conducted a mini program for the kids. “I thought we will help them. But I was wrong. These kids help us to appreciate life. They teach us to be positive all the time,” he continued. Yes, a visit to the Tahanan can fill your love tank. The smiles of the kids, their appreciation of the simplest things can open the eyes of one’s heart to see the blessings that most people tend to neglect. The Tahanan kids carry the love that we all need every day. Perhaps that’s the reason for its name — Tahanan ng Pagmamahal. It’s a place where one won’t only give love; he will receive love as well. Visit your home. Visit God’s home. Shepherd’s Voice Radio & Television Foundation, Inc.